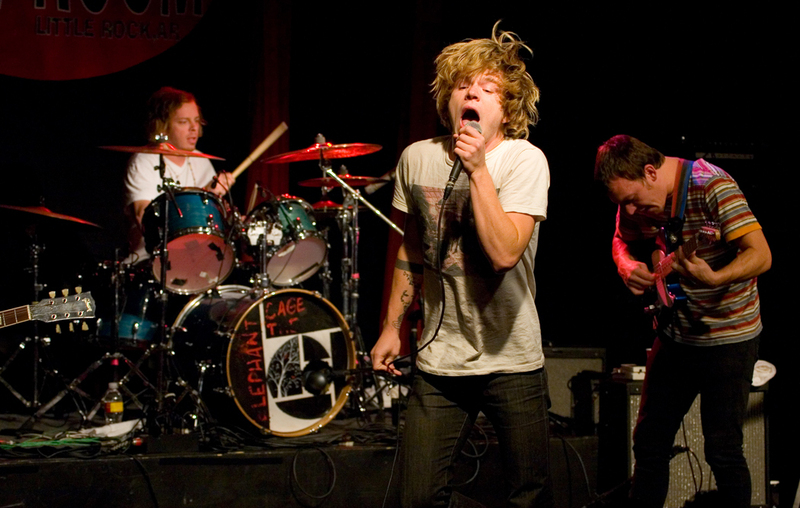 Bowling Green, Kentucky’s international rock thang known as Cage the Elephant done went and released the follow-up to 2008’s gate crashing debut record. The latest Thank You Happy Birthday finds singer Matt Shultz and his bro, Brad and their fellow band mates in fine form as they seemed to grown up a bit from the grind of the road paired with more than a hint of success, especially in the U.K. where “Cage” drew comparisons to early Stones while being paired with Brit math funk whiz kids Foals and punk skrunk stars The Subways on a few tours of the local pubs and halls. Leave it to the Eurotrash to appreciate Southern culture with aplomb us Yanks many times miss the first time through. Eventually “Ain’t No Rest for the Wicked” wasn’t gonna be denied on either side of the pond and the boys earned the dreaded “Next Big Thing” moniker. And frighteningly, they just may be…as indie rock and underground music has been revisiting disco, new wave and shoe gaze hilarity the past few months, the new Cage the Elephant record has jettisoned forward to the Northwest in the 90s sounds reminiscent of the best dirty noise-pop of his highness Kurdt and Mr. Cobain’s own influencers the Pixies. And let me tell you, this ain’t no bad thing. Although flannel may be the reference point for the vibe, the Shultz boys and crew do that thing that boys from the South do…add the unmistakable “twang.” Have you ever been up North, using your best “non-accent” to not give away your obvious rednecked-ness when out of the blue, someone hollers, “hey, I love your accent.” No matter how hard you try, it comes through…Cage the Elephant, they know they can’t hide where they hail from, so instead it becomes the best part of what they are. The songs themselves range in tone from ballady and sometimes a little bit hit-ish to angular and downright noisy and—aided handily by Shultz’s nasally bark and strange time changes—progressively punk. Yes, perhaps a two-headed stab at something for everyone but it doesn’t disappoint either in a world where it’s still okay to just be labeled a “rock” band. It is still okay, right? Hell, who don’t like hooks and this record has some, well, a lot actually. I urge you to grab it up. You’ll figure out on your own which tracks to dance to and which ones to make-out with. It’s the South, it’s dirty, it’s a sophomore, but it ain’t tenth grade, feel me? Click here to purchase Cage the Elephant via iTunes. Click here to purchase Thank You Happy Birthday on vinyl. Click here to purchase Thank You Happy Birthday on CD.